A quilt as window curtains?... Maybe! I've been toying with the idea of making two identical quilts to use as curtains in the huge window that's uptairs in my sewing room. I went to WalMart and bought a really beautiful curtain rod and also bought a couple of packages of clips to hold curtains. That's when I starting thinking perhaps I could use those clips to hold quilts instead of boring old curtains. Here's the layout I decided to go ahead a use. As you can see, I don't have a design wall in my sewing room, so I have to use the floor! 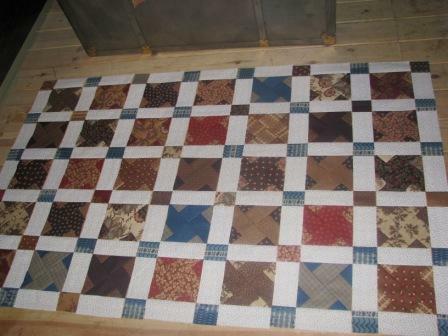 This is the first quilt top finished. The pattern is called "Playmates" and I found it in the Pam and Nicky Lintott book titled "Two From One Jelly Roll". 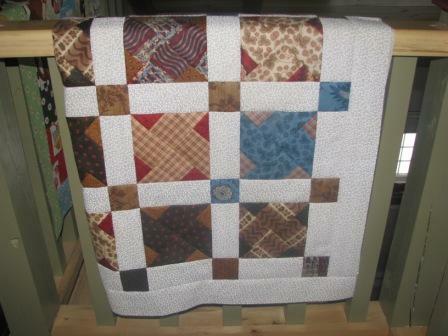 I'm using a "For a Cause: Alliance" jelly roll for this. 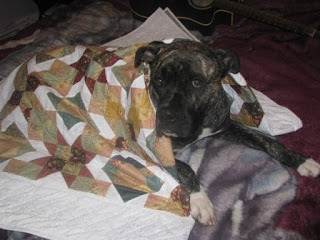 And this is Moose on the Porch Quilts' Layer Cake Quilt Along Block 4. 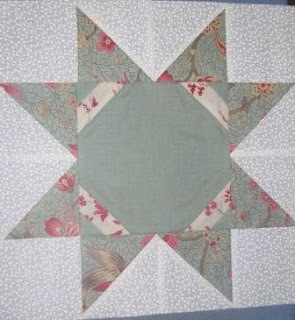 This block is called "Starry Starry Snowball and was designed by Sherri McConnell at http://www.aquiltinglife.com/. I've already downloaded the directions for Block 5, but I'm running a little behind on that one! Will have to catch up once the curtains are done. 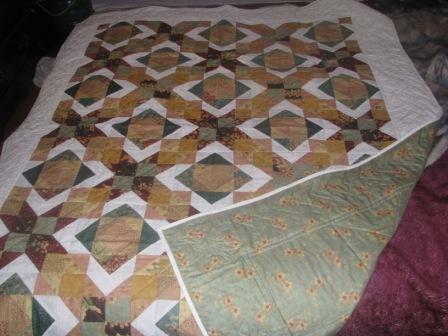 I'm also almost finished with another quilt top that I started back in November. I should be able to put the borders on that one during my next trip to the country so I'll post pictures when I get back. I'm done with my beautiful sister-in-law's birthday present (her bday is December 26 the poor girl!). The pattern is called "Twin Stars" and it's from the book "Jelly Roll Quilts" from Pam and Nicky Lintott. I used a "Old Primrose Inn" jelly roll for this one along with a tone on tone cream paisley for the background. 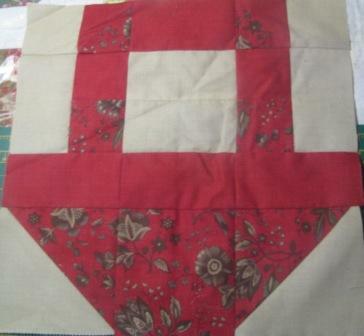 The backing is also from the Old Primrose Inn collection by Moda. So another project all done and ready to be received! I'm also almost done with all of the Christmas shopping... only a few small things left. And then I'll have to spend about 5 hours wrapping everything! Not sure I'm going to be getting any sewing done this coming weekend because we might be leaving for the weekend to go watch Big Dylan play hockey. That's it for now! Talk to you all later! Anyhow, not much quilting happening. 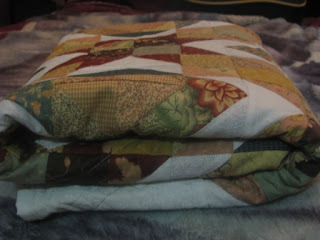 I did manage to complete Block 3 of the Moose on the Porch Layer Cake Quilt Along. This "basket" square was designed by Sarah Vanderburgh. I also prepared my sister-in-law's birthday present for quilting and I'm hoping to get that all done this coming weekend.